Will 2019 be the year of OLED TVs? LG certainly thinks so – with the company's own organic LED panel technology making up 20% of their portfolio this year. It's a year marked by collaboration, as seen in the Alexa and Google Assistant support coming to new LG ThinQ smart TVs in 2019 and the Airplay 2 support coming by way of Apple, allowing streaming of iTunes movies and TV shows. There's also be a host of visual enhancements with the new Alpha A9 (Gen. 2) processor, for better color correction and support for 120fps frame rates on high-end LG TVs – and, more importantly, the first of rollable OLED television, the LG Signature Series OLED TV R.
OLED vs QLED: which panel technology is better? That said, the 2019 general lineup will be similar to last year: LG OLED TVs at the high end, Super UHD or 'NanoCell' TVs – which have a lot of the same components as the OLED TVs, but lack the main OLED panel – in the middle, and then traditional 4K TVs and finally FHD screens at the bottom. LG is already rolling out its 2019 TV range to the US and China, with the UK and European markets set to start shipping in the coming weeks. Some of the specs listed below could change by the time of each TV's retail release, but for the most part the specs you see here should be the components that make it in the final product. [Update: We now have pricing and release dates confirmed for a number of LG's 4K televisions in the UK and US – with some landing as soon as April! Head to the list of TV models below to see what's been announced already]. Another year, another processor. The biggest change for the high-end screens (the OLED line-up) is the switch from last year's Alpha 9 (a9) processor to the a9 Gen 2. 2018's Alpha 9 silicon upgrade promised a 35% boost in CPU and GPU speeds, equating to smoother motion handling, object-based contrast enhancement for better sharpness and detailing and a technology called True Color Accuracy Pro. We're getting more of the same with the 2nd-generation processor, with a big focus on 'intelligent AI' and 'machine learning algorithms' to enhance picture, audio and software performance – with a new algorithm that's able to analyze the source content and optimize for ambient viewing conditions. We know for a fact the new a9 Gen 2 chip is being used in the LG Signature Series OLED R and new range of Z9, W9, C9, and E9 OLEDs – even the budget B9 model gets the latest chip! The new Alpha 9 processor also has the heft needed for High Frame Rate (HFR, 120/4K) – for that smooth motion crucial for sports, action, or gaming – but it'll only be in 2019 that we see LG TVs implement the HDMI 2.1 ports to make the most of it, so you can display in 120fps/4K from cabled sources, console, and media players. In May 2018 we saw LG roll out Google Assistant to all of its OLED and Super UHD TVs – meaning you could start using your voice to switch inputs, change the channel, connect to other smart home devices, and integrate with Google's Photos and Maps applications. This year's LG TV line-up – for OLED and Super UHD, at least – will also be arriving with Alexa capability for an even wider range of voice control options. 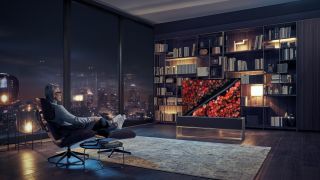 LG Signature Series OLED R (available in 65 inches): The standout television for 2019 is undoubtedly the 65R9 rollable OLED, featuring LG's new a9 Gen 2 processor. First teased at CES 2018, it's being slated for release in late 2019, using a flexible OLED panel to unfurl the television display at the touch of a button – perfect for saving space and, let's be honest, impressing guests. There's no RRP yet, but it'll certainly cost a small fortune – start rolling up those dollar bills. LG OLED Z9 (available in 88 inches): As the flagship LG OLED – or at least, the flagship that doesn't curl up into a box – the LG OLED Z9 is an 8K powerhouse with big promises for 8K upscaling and 'improved noise reduction' for clean, smooth images. With 33 million pixels across 88 inches of screen, it'll certainly have to work hard to do it – and the a9 Gen 2 processor will surely come in handy. LG OLED W9 (available in 65, 77 inches): The W9 upgrade to last year's LG W8 will come with the new a9 Gen 2 processor's improvements to High Frame Rate, HDR, and overall picture and sound processing – as well as the same thin, picture frame shape that made this 'wallpaper' television series so attractive. The W8 came with a 60W 4.2 Dolby Atmos soundbar built in to the set, so we're likely to see similar audio credentials for this model. The 65-inch model will retail at $6,999 / £6,999 (around AU$9,800) while the 77-inch jumps up to $12,999 / £12,999 (around AU$18,300). LG OLED E9 (available in 55, 65 inches): If last year is anything to go by, the new E Series model will feature the same specs at the W9, but with a glass body and tacked-on chassis instead of the W8's 'wallpaper' design. Expect a $3,299 / £3,999 (around AU$4,600) price tag for the 55-inch, and $4,299 / £4,299 (around AU$6,050) for 65 inches. LG OLED C9 (available in 55, 65, 75 inches): The newest C Series model is confirmed, and experience teaches us to expect a neat balance of performance and price, without ditching the company's latest processor to do it. Last year's LG C8 came with a 2.2 soundbar too. Sets will retail at $2,499 / £2,499 (around AU$3,500) for the 55-inch, $3,299 / £3,299 (around AU$4,600) for the 65-inch, or $6,999 / £7,499 (around AU$9,800) for the 77-inch. LG OLED B9 (available in 55, 65 inches): Unlike last year's LG B8 model, the more budget-friendly B Series OLED won't be left behind with an ageing processor. The LG B9 will carry the a9 (Gen 2) chip, though with a cheaper build and less advanced panel than the other OLEDs in this list. SM9975 (available in 75 inches): LG's leading LCD television set will be the SM9975, a 75-inch TV with 8K resolution (US only). LG is rebranding its Super UHD TVs as the far fancier 'NanoCell' range, to better represent the jump in picture quality and color accuracy compared to cheaper LG models – with the high-end a9 Gen 2 processor and High Frame Rate to make it happen. US release: Yet to release. SM9500 / SM9800 (available in 55, 65 inches): More NanoCell, less processing. The LG SM9500 (SM9800 in the UK) packs in the 2nd-generation Alpha 7 processor, rather than the Alpha 9, but comes with Full Array Dimming Pro for more uniform black levels, as well as Dolby Vision and Dolby Vision, and LG's ThinQ AI smart platform. No Dolby Atmos soundbar, though. UK release: The 55-inch and 65-inch models are launching in May for £1,999 / £2,999. US release: Retailing now, at $2,699 for the 65-inch model. SM9000 (available in 49, 55, 65, 75 inches): One step below the previous model, with the same a7 Gen 2 processor, but Full Array Dimming rather than the upgraded 'Pro' technology seen on the SM9500 – meaning less lighting control and less consistent brightness. UK release: The three smaller models (49, 55, 65 inch) are all available in April, for £1,499 / £1,799 / £2,499 – while the 75-inch launches in May for £2,999, and the 86-inch model launches in July for £4,499. US release: Listed in 55 and 65-inch sizes in the US, which are retailing now at $1,399 and $1,999 respectively. SM8600 / SM8500 (available in 49, 55, 65, 75 inches): An update to last year's new SK8500 range, these models sticks with the a7 Gen 2 processor, but with a generally cheaper design and only more basic Local Array dimming zones rather than the Full Array Dimming of the more costly models. The only difference between the SM8600 and SM8500? The TV stand. UK release: The 49, 55, and 65-inch models land in late April. We've been given a price range of £1,299 / £1,499 / £2,299 for the three sets, while the 75-inch SM8600 model arrives in early May at a higher £2,999. US release: Only 49, 55, and 65-inch models confirmed, currently listed at $799 / $999 / $1,499 in the US.